1 Comment on What font to use for your next presentation? What font to use for your next presentation? There are too many fonts out there in the wild. If you look at the drop down menu of your word processor, there are a wide variety of fonts. And if you further go down the internet font rabbit hole, your options are limitless. What matters more is readability. And there are mainly two types of fonts when it comes to that. Handwriting fonts such as cursive are cool and all but they aren’t very readable. So, we’ll focus on two important font types here. It’s really easy to spot a serif font. All you need to do is look at the feet. If your font contains the feet then it is a serif font. Why does it have those feet? Back in the old Latin times when letters were carved on stones, it left those feet called serifs. Hence, the font name serif. Sans serif does not have those feet. It is more modern. What is the feel of your presentation? If you want a more traditional feel, pick a ‘Serif’ font and if you want a more modern feel, pick a ‘Sans Serif’ font. What you can also do is pick a ‘Serif’ font for the heading and ‘Sans serif’ for the body of the text as ‘Sans serif’ font is more readable. Basically, don’t combine a ‘Serif’ font with another ‘Serif’ font. 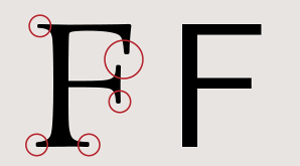 And, a ‘Sans Serif’ font with another ‘Sans Serif’ font. Another thing to do is notice is the era of the font. If two fonts are from a similar era then they go really well. This Google material design note explains it really well. If you would like to read more about the types of Serif and Sans Serif fonts and when to use them then this medium article is the best out there. Amazing title for a unique blogg my friend. Your choice of title for font is quite amusing at first to read but with on going read, the progressive usage of text backgrounds and its usability has had its impacts on me right now. I shall work with san serif and serif from now on. Keep us posted, thank you.